Some residents from the town of Pilar in Buenos Aires claimed having seen a UFO around 8:30 a.m. on Friday morning, according to a statement made to a radio show. “I saw something very odd, with a strange color. If I had to judge by its size, it was 10 meters tall. It wasn’t a flying supermarket bag,” said Martín, a listener of the “Club 88” program on FM Estación Pilar. “I saw a flying object with a rounded shape, measuring approximately 10 meters, opaque white in color, moving horizontally over the Pilar Golf Club. A few minutes later, when I got out of my car to get a better view, it was no longer there,” said the man, who managed to photograph the unidentified flying object. 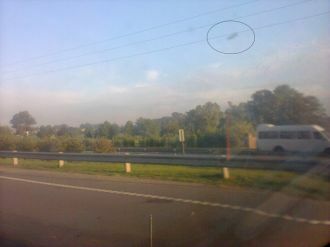 The sighting took place near the Pilar Industrial Park, but the image provided by Martín has yet to be analyzed. Otherwise, the question of whether it was an alien spaceship or a device created by humans remains open. “Air Force personnel must be consulted. Ordinarily, weather balloons were launched to sample the wind conditions, and these are elements that appear white and round, which is something that not many people are aware of, and they are frequently sighted,” said Andrea Pérez Simondini on air in the program. Simondini belongs to the “Visión OVNI” organization in Victoria, Entre Rios, which specializes in mysterious events related to aliens. “But [weather balloons] are hard to see because they are small and fly at high altitudes,” agreed the expert. “It wasn’t the type of balloon that conveys people in a basket. First, the colors were completely opaque. It was leaden grey, and could not carry any kind of basket under it,” explained a man during a conversation that was broadcast live. Was there a sighting of UFOs in Pilar, or a new broadcast of the radio classic War of the World with which Orson Welles startled American audiences in 1938, making them believe that a Martian invasion was underway?